ATX-101 (Allergan, Dublin, Ireland), an injectable drug containing deoxycholate (DC), was recently introduced into the US, Canadian, and European markets for noninvasive treatment of submental fullness (SMF). Submental fat accumulates in a distinct compartment within the preplatysmal fat; it is considered aesthetically unappealing and has a negative psychological impact on patients. In a recent study, Jacono and Malone determined that the preplatysmal fat pad is enlarged in the elderly patients. ATX-101 was shown to be safe and effective for noninvasive reduction of SMF in two randomized controlled trials,; however, patients have raised concerns about a burning sensation felt immediately after injection. To mitigate this discomfort, the manufacturer of the drug suggests placement of ice packs or induction of local anesthesia before injection. In this case series, the author describes his experience in treating SMF by injection of a premixed solution of ATX-101 and 2% lidocaine. This approach allowed for pain relief on drug delivery. From May 2017 to September 2017, 12 patients (10 women, 2 men) who presented with SMF were treated by injection with ATX-101 (10mg/mL; trade name, Belkyra) that had been premixed with lidocaine hydrochloride (20mg/mL; Bioindustria L.I.M., Novi Ligure, Italy). Before treatment, the preplatysmal fat was identified, and the potential change in neck anatomy associated with managing the SMF was assessed. 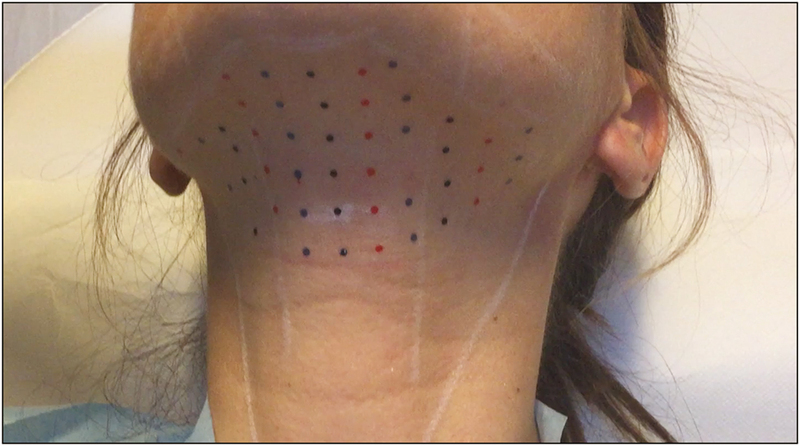 The area to be treated was marked with a surgical pen, and a grid (with points spaced at 1-cm intervals) was applied to mark the injection sites, as suggested by the manufacturer [Figure 1]. Preparations of ATX-101 (10mg/mL; 2mL per vial) were premixed with 0.5mL of lidocaine at a concentration of 20mg/mL. The solution then was injected as 0.25-mL aliquots by means of a 12-mm, 32-gauge needle. The injections were made at 1-cm intervals at an approximate depth of 7mm in the central area of the grid and at an approximate depth of 3–4mm in lateral areas of the grid [Figure 2]. Patients were photographed pretreatment and 2–3 months posttreatment. At the follow-up visit, the degree of skin tightening over the preplatysmal fat was assessed and pre- and posttreatment photographs were compared. After the treatment session, the patients were asked to indicate whether the injection was painful. Specifically, the patients were asked to compare the level of pain or discomfort to that of a previous aesthetic treatment involving the face, such as placement of filler or botulinum toxin type A. Of the 12 patients included in the study, only 1 had not undergone a facial aesthetic treatment previously. The age range of the patients was 22–56 years. 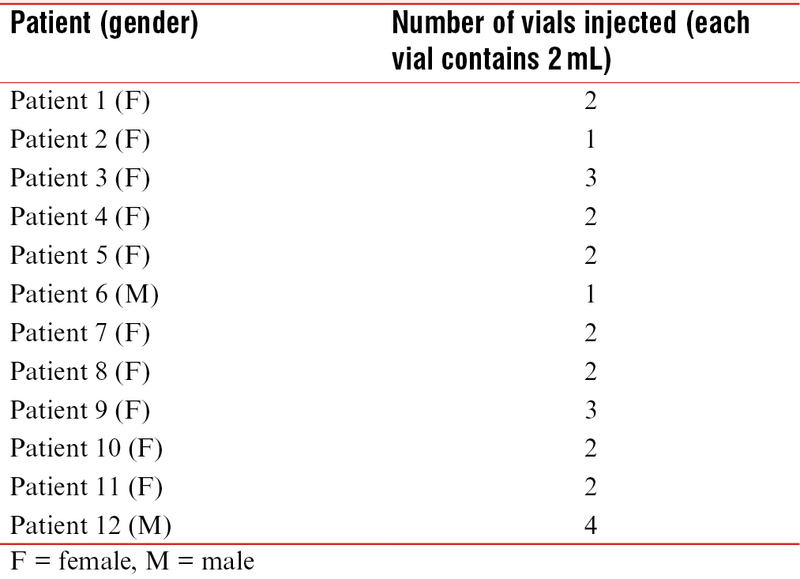 Each patient received multiple injections in a single session, with one to four 2-mL vials of ATX-101 delivered per treatment (mean, 2.16 vials; total, 26 vials; [Table 1]). All patients experienced postinjection swelling that persisted for an average of 15 days (range, 10–28 days). All patients indicated improvement in skin tightening from the 2nd month postinjection. Three patients had minor ecchymoses at the injection sites, which resolved spontaneously within 10 days posttreatment. One patient experienced dysesthesia of the treated area, which lasted approximately 40 days and resolved spontaneously. No other complications—such as nerve paresis or alopecia—were recorded. No patient required analgesic drugs postinjection. In [Table 2], patients’ perceptions of pain and discomfort associated with this procedure are summarized relative to previous facial aesthetic medical treatments that that patients had undergone. To ease the pain of ATX-101 delivery, the manufacturer suggests preparing the area to be injected with ice packs. However, the efficacy of ice packs for pain relief after DC injections is debatable. In a recent practical and theoretical course, Sherman noted that the patient discomfort could be reduced by prefilling 1-mL syringes with the amount of drug solution needed and performing the procedure as quickly as possible. The manufacturer also has suggested local anesthesia for pain mitigation before ATX-101 injection. However, the induction of local anesthesia before ATX-101 injection has anatomic consequences because the anesthetic leads to swelling. Therefore, it is necessary to wait for approximately 15–20min between delivery of the anesthetic and injection of ATX-101. In this study, the author mixed each 2-mL vial of ATX-101 with 0.5mL of lidocaine and injected 0.25mL of the mixed solution into each 1-cm2 area of the grid. No patient in this case series indicated that pain was felt during the injections. The results summarized in [Table 2] support the hypothesis that premixing with lidocaine allowed for drug delivery with little discomfort compared with other aesthetic medical treatments involving the face. Eleven of the twelve patients in this series had previously undergone a facial aesthetic medical treatment. Five of these eleven stated that they felt the same amount of pain and discomfort that they had felt during other aesthetic facial procedures; six patients indicated that the injection of the ATX-101 mixture was less painful. We attribute this result to premixing with lidocaine. The volume of 2% lidocaine added to each vial was chosen because it is a sufficient amount required for pain reduction and it allows for simple calculation and delivery. The manufacturer recommends a dose of 0.2mL of ATX-101 per site, and each vial contains 2mL of product. Therefore, from each vial, two 1-mL syringes can be filled for injection at 10 sites. After premixing each vial with 0.5mL of lidocaine, the practitioner can fill two and a half 1-mL syringes and inject 0.25mL of solution at 10 sites. The amount of lidocaine used in this study is much less than the amount of lidocaine used by other authors to induce local anesthesia before ATX-101 injection. 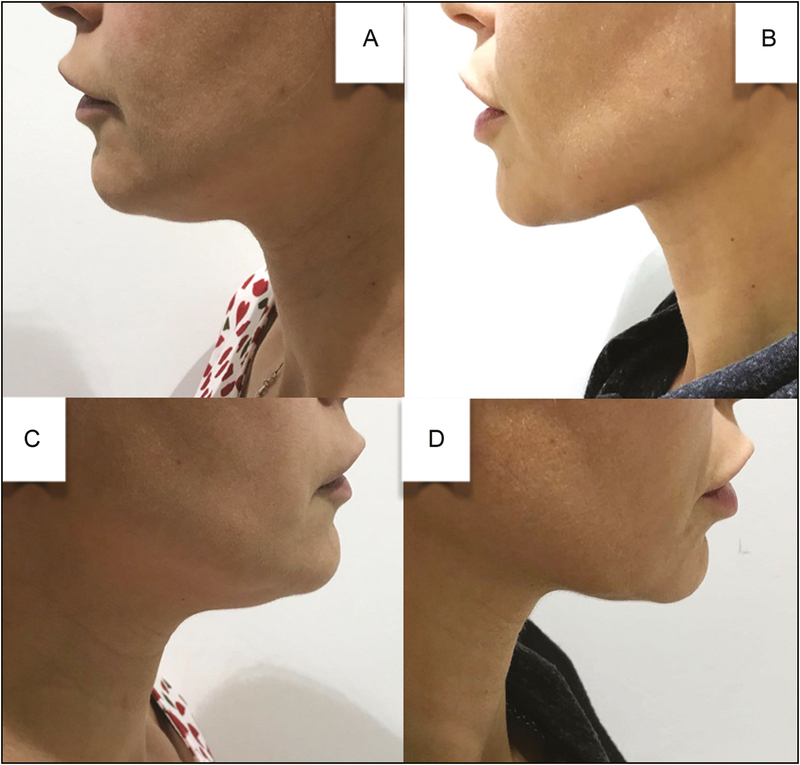 The premixed solution of ATX-101 and lidocaine was found to be effective for managing SMF as shown by posttreatment photographs that depict improvements in preplatysmal fat reduction and skin tightening [Figures 3]. The anhydrous disodium phosphate buffer in ATX-101 is robust to pH changes on addition of another drug; therefore, we did not expect to see a decline in effectiveness with lidocaine premixing. Importantly, no precipitate was observed in the mixture. Other investigators have noted several adverse outcomes of ATX-101 injection. These include edema, site-injection ecchymosis, nausea, vomiting, headache, alopecia, and paresis. Patients in this case series experienced only edema and site-injection ecchymosis following treatment with ATX-101 plus lidocaine. ATX-101 is a relatively new drug that contains DC and is indicated for noninvasive treatment of SMF. To address a common patient concern of pain associated with injection of ATX-101, we performed injections of a premixed solution of ATX-101 and lidocaine (0.5mL of lidocaine per 2-mL vial of ATX-101). In a series of 12 patients, we determined that pain was well controlled and aesthetic improvements in SMF were achieved with few side effects. Pilsl U, Anderhuber F. The chin and adjacent fat compartments. Dermatol Surg 2010;36:214-8. Rzany B, Carruthers A, Carruthers J, Flynn TC, Geister TL, Görtelmeyer R, et al. Validated composite assessment scales for the global face. Dermatol Surg 2012;38:294-308. Jacono AA, Malone MH. Characterization of the cervical retaining ligaments during subplatysmal facelift dissection and its implications. Aesthet Surg J 2017;37:495-501. Rzany B, Griffiths T, Walker P, Lippert S, McDiarmid J, Havlickova B. Reduction of unwanted submental fat with ATX-101 (deoxycholic acid), an adipocytolytic injectable treatment: results from a phase III, randomized, placebo-controlled study. Br J Dermatol 2014;170:445-53. Ascher B, Hoffmann K, Walker P, Lippert S, Wollina U, Havlickova B. Efficacy, patient-reported outcomes and safety profile of ATX-101 (deoxycholic acid), an injectable drug for the reduction of unwanted submental fat: results from a phase III, randomized, placebo-controlled study. J Eur Acad Dermatol Venereol 2014;28:1707-15. Belkyra [package insert]. Markham, Ontario: Allergan; 2016. Duncan D, Rotunda AM. Injectable therapies for localized fat loss: state of the art. Clin Plast Surg 2011;38:489-501, vii. McDiarmid J, Ruiz JB, Lee D, Lippert S, Hartisch C, Havlickova B. Results from a pooled analysis of two European, randomized, placebo-controlled, phase 3 studies of ATX-101 for the pharmacologic reduction of excess submental fat. Aesthet Plast Surg 2014;38: 849-60. Sherman D. Ri-definire il profilo. Practical and theoretical course. Rome, Italy; 2017. Shridharani SM. Early experience in 100 consecutive patients with injection adipocytolysis for neck contouring with ATX-101 (deoxycholic acid). Dermatol Surg 2017;43:950-8.